Many drivers know that Honda is a Japanese automaker brand, but many might be surprised to learn of Honda’s long history of manufacturing models and parts in the United States. Since 1982, Honda has built 25 million vehicles in the U.S. and American Honda is the most represented automaker in Cars.com 2018 American-Made index, which assess where automakers manufacture their vehicles. 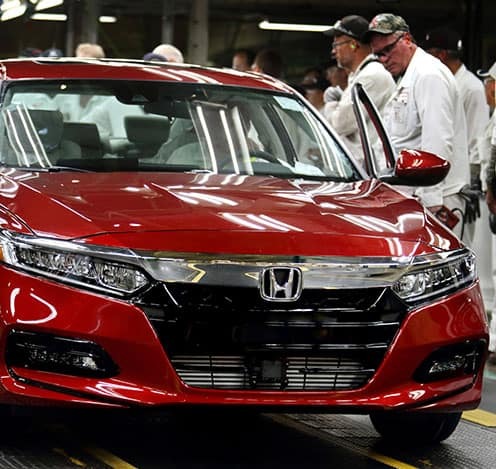 In 2017 alone, nearly two-thirds of the Honda and Acura models sold in the U.S. were made in the U.S.
Honda now has 12 manufacturing facilities located across the United States. Since 2016, the Acura NSX supercar has been exclusively produced at a Honda facility in Marysville, Ohio, making it the only supercar produced in the United States. Other facilities throughout the U.S. manufacture Honda and Acura models along with their engines and components, including the auto industry’s first 10-speed automatic transmission for front-wheel drive vehicles, which is produced in Georgia. Drivers can find this 10-speed transmission inside the Honda Odyssey or the Acura RLX. In addition to manufacturing facilities, Honda also has 14 research and development centers in the U.S., working hard to initiate redesigns and engineer and develop Honda’s excellent models and long-lasting components and parts. Honda Manufacturing of Alabama in Lincoln, Alabama exclusively produces all the Honda Odyssey, Ridgeline and Pilot. A popular and award-winning minivan, the Honda Odyssey earns the #2 spot on Cars.com American Made Index, making it the second most produced vehicle in the United States. Spacious and versatile, the Odyssey can accommodate passengers and tons of cargo and comes with family-friendly features including an available rear entertainment system, an in-car PA system, and built-in vacuum, and much more. Find out more information on the Honda models by contacting us or visiting your nearest West Michigan Honda Dealer. Explore current offers and sit behind the wheel of the model that is right for you with a test drive today.